Bay Area foodie reviews Giordano Bros.
I’m a big fan of French fries. (Who isn’t?) I’m also a fan of sandwiches. Thus, the only thing better than a sandwich and fries is fries inside a sandwich. Surprisingly, only a handful of restaurants have caught on to this gluttonous combination, and Giordano Bros. is one of them. Nestled in the heart of North Beach, it’s the perfect casual spot to sate your carb-on-carb craving. 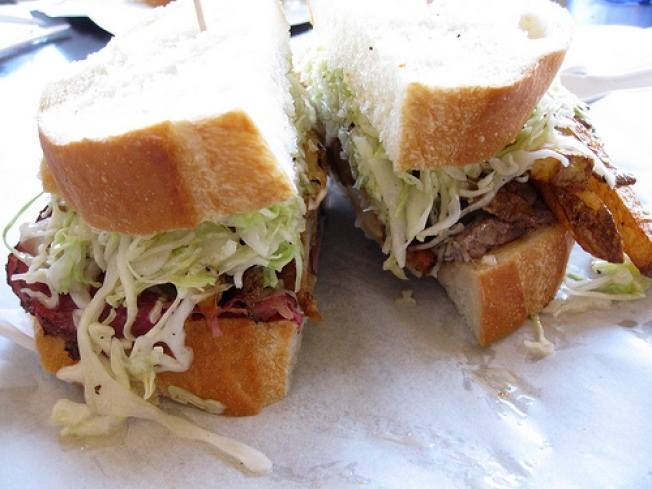 Giordano Bros. models their sandwiches after a Pittsburgh tradition, of which I knew very little about. According to the proprietor, Giordano’s sandwiches are an ode to those served at Primanti’s in Pittsburgh. This tradition also includes showing Steeler games (think sports bar, not white tablecloth). During our first visit, my dining companion and I split our sandwiches so we could each get a taste of both worlds. We shared the pastrami and the steak. The pastrami was saltier, but I actually preferred the texture of the pastrami over that of the steak. Both were solid though, and nestled between all those French fries and white bread, they were hugely satisfying. Don’t worry, though – the sandwiches also have a serving of tangy, light coleslaw, so you’re getting some greens. Or something. Service is super laid-back and casual and Giordano’s, evoking a neighborhood feel in an area that can otherwise feel touristy at times. Health-consciousness aside, this is a terrific place when you’re craving a hearty, comforting sandwich. With French fries, of course. Glorious, glorious French fries.